Crab and spring onion macaroni is a decadent twist on the classic macaroni cheese which begs to be cooked and savoured. 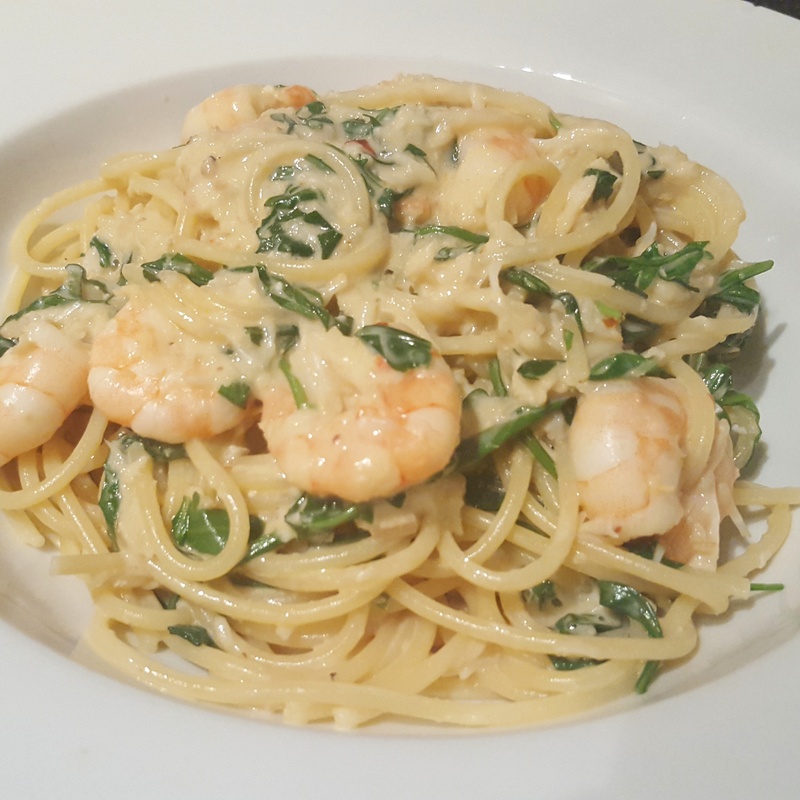 I have used brown and white crab meat and I find this gives much more flavour compared to only using white so do look out for both. A hint of fresh red chilli would also be delicious in this recipe if you want to spice things up a bit but go easy as you don’t want to overpower the delicate crab. Compared to my usual macaroni cheese, this uses a small amount of good quality parmesan cheese so keep it simple. I have included panko as a topping mixed with parmesan which gives an added texture and crunch. 1. Start by preheating the oven to 200c/ 180 fan whilst you cook the pasta as per packet instructions; drain well and set aside. To get going with the sauce take a medium saucepan and melt the butter and flour together to form the base of the sauce. Gradually pour in the milk and cream and keep stirring so it doesn’t catch on the bottom of the pan; bring to a simmer and cook until thickened. 2. Remove the sauce from the heat and add half of the parmesan cheese as well as the crab meat. Stir well to combine before popping in the shredded spring onion. Add the cooked macaroni into the sauce and ensure that each piece is well coated in the sauce. Place in an ovenproof dish before topping with the remaining parmesan and panko breadcrumbs, if you’re using them. 3. Bake for 30 minutes until the topping is golden and bubbling and serve right away with a side salad if you like. 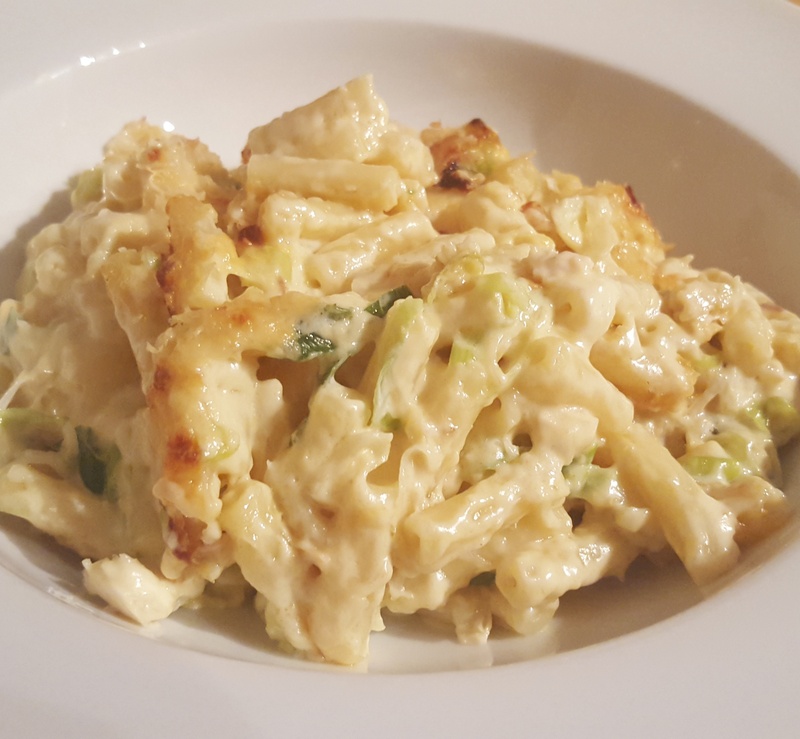 Indulgent crab and spring onion macaroni- a sumptuous twist on a comfort food favourite! Pad thai is a classic street food dish that can be tweaked and adapted to please even the most fussy of eaters. As long as it is packed with delicious noodles and flavours then the world is your oyster- or crab and prawn in this instance. I have also added tofu in for extra texture- if you don’t routinely use it then do give it a go! You may well be surprised. I have chosen a firm tofu here which I think is the best way to introduce yourself to the bean curd world. The key to a perfect pad thai is in the preparation. Once the you start, it happens relatively quickly so you really do need to prep everything beforehand. 1. Beat the eggs lightly and add a tablespoon of the fish sauce before setting aside ready for later. Read the instructions for your rice noodles at this stage as some need soaking for longer than others. Prepare according to instructions all ready for later. 2. Take the tamarind water and add the palm sugar and remaining 2 tablespoons of fish sauce. Stir well to ensure the sugar dissolves; if you find it has not fully dissolved you can add a splash of boiling water to help things along. 3. Place a large wok over a medium/ high heat and add 2 tsp of vegetable or groundnut oil. Add the tofu cubes, in a couple of batches if needed so as to not overcrowd the pan, and fry off until golden all over. Set aside to blot of kitchen paper. 4. Next you need to cook the garlic, chillies, ginger, shallots and spring onion until softening. You could also add a piece of finely sliced lemongrass at this stage of you like. 5. Pop in the prawns and the tamarind water to the wok and cook for a few seconds to make sure the prawns are coated. Add the noodles back into the wok and cook for a minute or so, again ensuring the strands are coated in the tamarind. Next into the wok goes the crab, bean sprouts, chive, basil, coriander and tofu. Toss gently to heat through. At this stage I then pushed the noodle mixture to one side in the wok and added the beaten eggs. Beat them in the wok until it begins to scramble and then you can mix it all the way through the rest of the noodles so the egg is well dispersed. 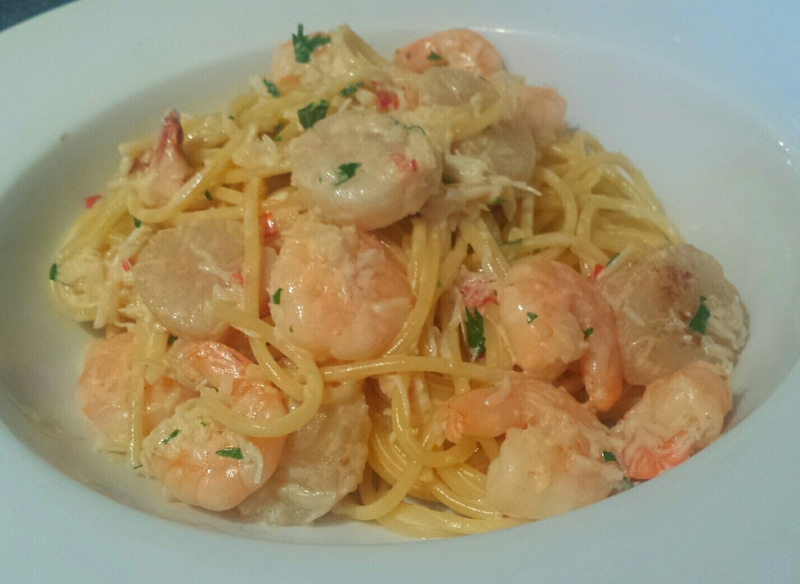 Heat until the noodles are warm, the tofu is reheated and the prawns are a delicate blush pink. Divide between 2 bowls and serve with a garnish of chopped peanut and you can add some roasted chilli flakes for an extra bit of spice or some extra chives if you like. 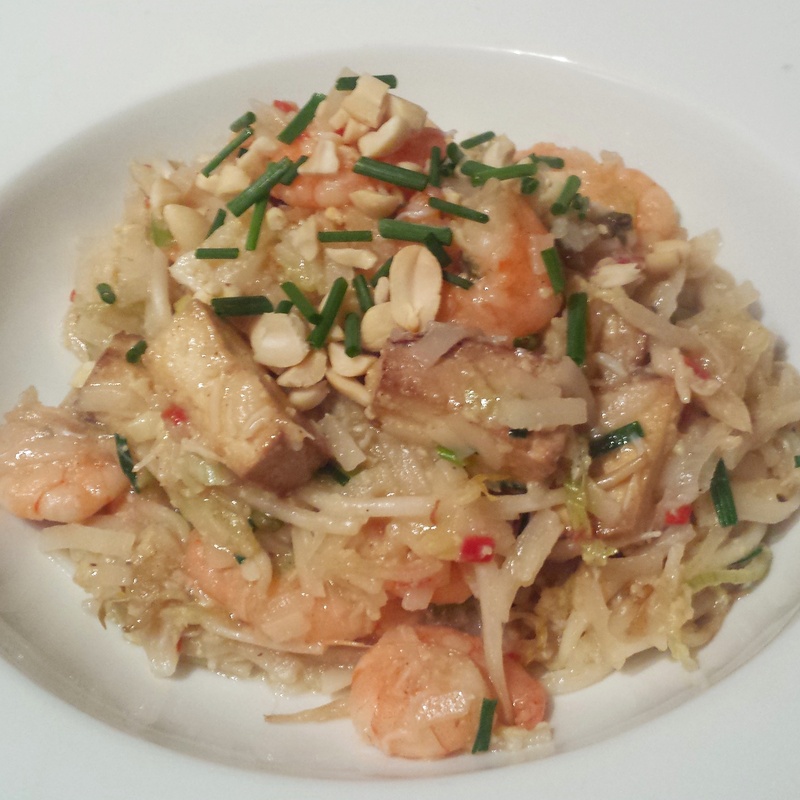 Prawn, crab and tofu pad thai- a satisfyingly savoury dish that will leave you wanting more!